I had plenty of basil in the garden, but the season is almost over now. The other day I picked the last bunch. 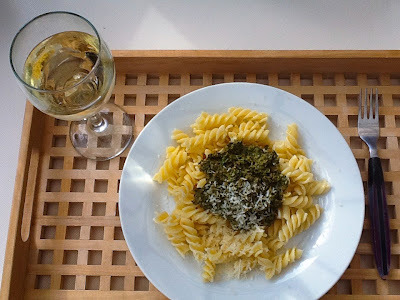 Pasta with pesto is the fastest food I know, and it tastes wonderful when the basil is freshly picked. Collect, wash and drain fresh basil. Fry pine nuts in a dry saucepan. 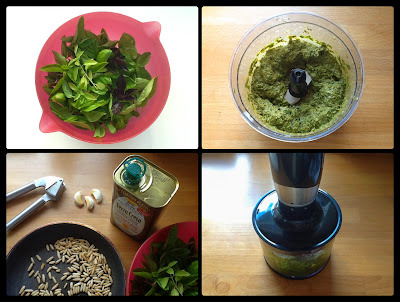 In a blender, puree the basil and the pine nuts with lemon zest and juice, olive oil, salt, pepper and garlic. Proportions are up to your taste. Meanwhile, cook pasta. Mix the pesto with the pasta and add grated Parmesan cheese (optional). Posted in Main course. Tags: basil, garlic, lemon, olive oil, pesto, pine nut on 20/10/2014 by Maagedeli.